Ambitious plans to create a multimillion pound next generation science park on the former St Patrick’s Barracks site in Ballymena are designed to arm local people with the skills to compete on a global stage as digital innovators and entrepreneurs. Under up to £1bn of co-investment outlined through the Belfast Region City Deal proposals, around £26m of investment is earmarked for the ambitious project in the town. Belfast Region City Deal sets out a plan to grow the economy, boost jobs and tourism, increasing skills, encouraging investment and developing infrastructure. The substantial economic opportunity includes plans for around £80m of investment in Mid and East Antrim, including St Patrick’s, The Gobbins and Carrickfergus Castle, Walls and surrounding environment. The proposed Integrated Industrial Inspiration and Innovation Campus, i4C, in Ballymena will encompass an inspiration programme to inspire and harness the talents of young people through a controlled series of high quality work experiences creating unique personal profiles for each person, matching them to an online mentor and connecting them to future matched enrichment activities. The activities will focus on identifying the entrepreneurs of the future and linking them to workshops with existing entrepreneurs, linking the coders of the future to coding clubs, and providing a pathway for future apprenticeships. Last month Chancellor Philip Hammond MP confirmed a £350m Treasury commitment to bolster the proposed £1bn City Deal and the partners are now working closely together to move the projects to the next stage. Seven Mid and East Antrim councillors sit on Mid and East Antrim’s Belfast Region City Deal committee. They include Councillor Audrey Wales MBE, Alderman Robin Cherry MBE, Councillor Billy Ashe MBE, Councillor Robin Stewart, Alderman Gregg McKeen, Councillor Timothy Gaston and Councillor Robert Logan. Alderman Robin Cherry MBE said: “Our delegation visited Westminster ahead of the budget announcement to showcase the fantastic potential in our borough. Councillor Timothy Gaston said: “The plans for St Patrick’s are really ambitious and would breathe much-needed new life into our town in the wake of the significant job losses from Michelin and JTI in recent years. “This is all about diversifying and putting in place the ideal environment for our next generation to grow their skills and create a state-of-the-art hub for innovation in Ballymena. 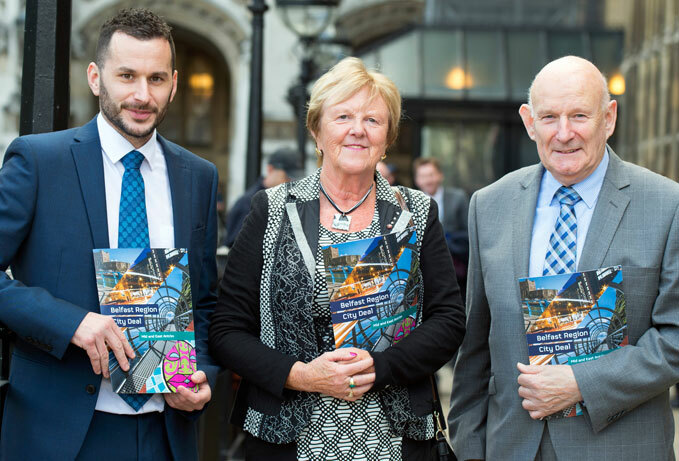 Councillor Audrey Wales MBE said: “We are doing everything within our power to create a vibrant business and economic culture in Ballymena and across Mid and East Antrim. Mid and East Antrim Borough Council, alongside the other local authority partners, will continue to work in close collaboration with the Northern Ireland Civil Service, Northern Ireland Office, Ministry for Housing, Communities and Local Government and the Treasury as well as our Universities and Further Education Colleges to move forward with the City Deal plans.